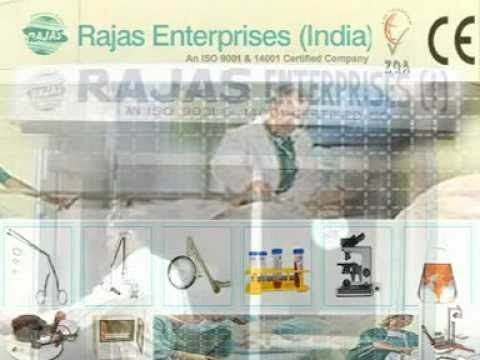 Making a mark for itself, Rajas Enterprises (India) specializes in the manufacture and export of superior quality and creatively designed Medical Equipment, Hospital Furniture Dental Equipment, Ophthalmic Equipment, ENT Equipment, Wooden Educational Toys, Rehabilitation Equipment, Physiotherapy Equipment, Surgical Instruments and Other Medical Equipment. Since inception in the year 1966, we have been continuously manufacturing and exporting our high performing and precision equipment around the globe. Being An ISO 9001 and 14001 certified company. We believe & function with the principle that the growth of a company is directly proportionate with the quality they produce. We have adopted stringent quality control measures to ensure that we strike the perfect "balance" between the quality we produce and the costing of our products, and most of our product are having CE certification. We take pride in spreading our products across the globe and our highly efficient Medical, Surgical, Dental, Eye, ENT, Physiotherapy, Medical Education and Rehabilitation Equipment have been well accepted by the clients all over. This has been one of the major reasons behind our success in more than 35 countries by now.